The 2006 Origins Award winning miniatures game is released to the public with many expanded features. NEW BRAUNFELS, Texas - Sept. 15, 2015 - PRLog -- Two Hour Wargames (http://twohourwargames.com/) in association with Lock ’n Load Publishing (www.lnlpublishing.com) are excited to announce the release of “All Things Zombie – Reloaded,” an expanded 2nd Edition of the 2006 Origins Awards winning game All Things Zombie. Designed by Ed Texeira, “All Things Zombie – Reloaded” has introduced new elements to this already exciting game requiring players not only join other players in surviving but also work against them as well as dealing with new survivors, militants and gangs. The world is even more dangerous than before as it isn’t just zombies players must worry about surviving against. 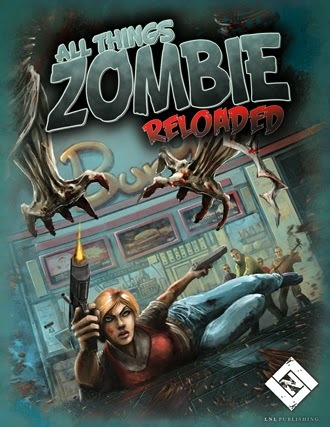 “All Things Zombie – Reloaded” is designed so that players can play it co-operatively, against one another or even as a solitaire game. It includes the ability to play it as a one-time game or as part of a larger campaign allows players to delve deeper into the experience and create a world of their own. “We’re pleased to announce the release of All Things Zombie – Reloaded, our board game based on the Origins Award Winning Miniatures game of the same title.” States Ed Texeria. Get more information or purchase All Things Zombie - Reloaded from its official product page (http://store.lnlpublishing.com/all-things-zombie-reloaded). Check out the promotional video on YouTube (https://www.youtube.com/watch?v=Loni-7KiD94) and be sure to subscribe to the Two Hour Wargame channels to see more promo videos. Box art and other art assets are available by contacting david@thelowryagency.com. Lock ’n Load Publishing, LLC. are a leading developer-publisher in both the table top and video games. Since 2006 Lock ’n Load Publishing has developed and published 75+ of historical, strategy and fantasy games with many award-winning titles in their portfolio spanning both digital and table top platforms. Lock ’n Load Publishing’s mission is to provide new game designs and redefine how people play games.